Replaces the battery box for your Hopkins Engager Breakaway kit (20099). Call 800-298-8924 to order Hopkins accessories and parts part number HM20120 or order online at etrailer.com. Free expert support on all Hopkins products. 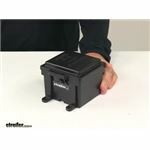 Guaranteed Lowest Price and Fastest Shipping for Replacement Box with Non-LED Lid for Engager Breakaway Kit. Accessories and Parts reviews from real customers. Speaker 1: Today, we're taking a look at the replacement box with a non-LED lid for the Engager breakaway kit. This is designed to fit the Engager breakaway kit, part #20099. Really, it's just a battery box, so it's a nice durable plastic construction. Has the mounting tabs on the bottom. Mounting hardware not included. Has the lid that snaps shut. You can easily open it, gain access to the battery. It does have the hole on the bottom, so that way, if anything gets in the box, it does have a way to escape, moisture and dirt, that type of stuff. The lid is lockable. Two little holes there. That way, you can lock it to add security. A lock is not included.Basically, with this video, what I want to do is I just want to go over the measurements of the box. I took measurements of the box with it all closed up, so the external measurements. Edge to edge, this direction, I got a measurement of about 5 1/8". Overall height is about 4 1/8". Front to back, the widest measurement is at the mounting tabs. If we measure from this mounting tab, the edge of it to the edge of this mounting tab, it's about 6 1/4". Now, the mount holes right here, these are separated on center by 3", and then these mount holes are separated from this one on center at a straight line measurement by about 5 1/2". Mount hole diameter's 1/4".Internally, we took some internal measurements as well. At the bottom of the box it measures 4 1/4" wide by 4" front to back and 3 1/4" tall. At the top, here at the opening, it's 4 11/16" wide by 4 3/8" front to back. That's going to do it for today' look at the replacement box with non-LED lid for the Engager breakaway kit. Order: RelevanceNewestRating - High to LowRating - Low to High Replaces the battery box for your Hopkins Engager Breakaway kit (20099). Still working fine, as the day I put it on the trailer. The HM2010 battery boxes are working very well after one year in my game cam application and have served well in all weather conditions including snow burial during the winter months!!! 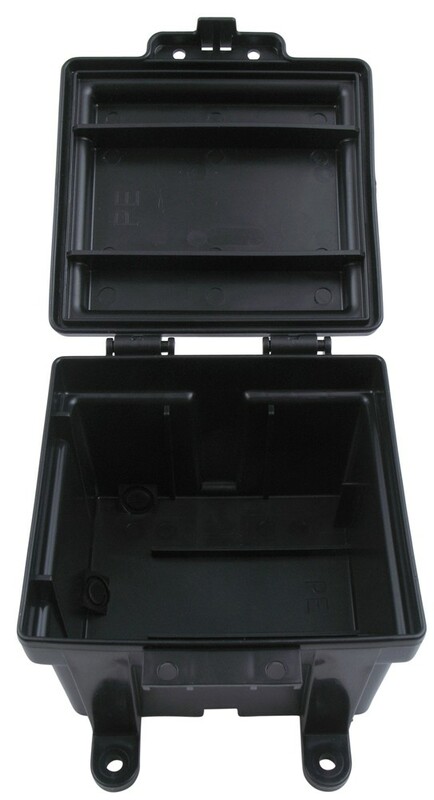 We do indeed have a battery box that's specifically designed for that battery. The part number is # HM20120. You can see current pricing by clicking the provided link. The box can be ordered online by using the provided link. 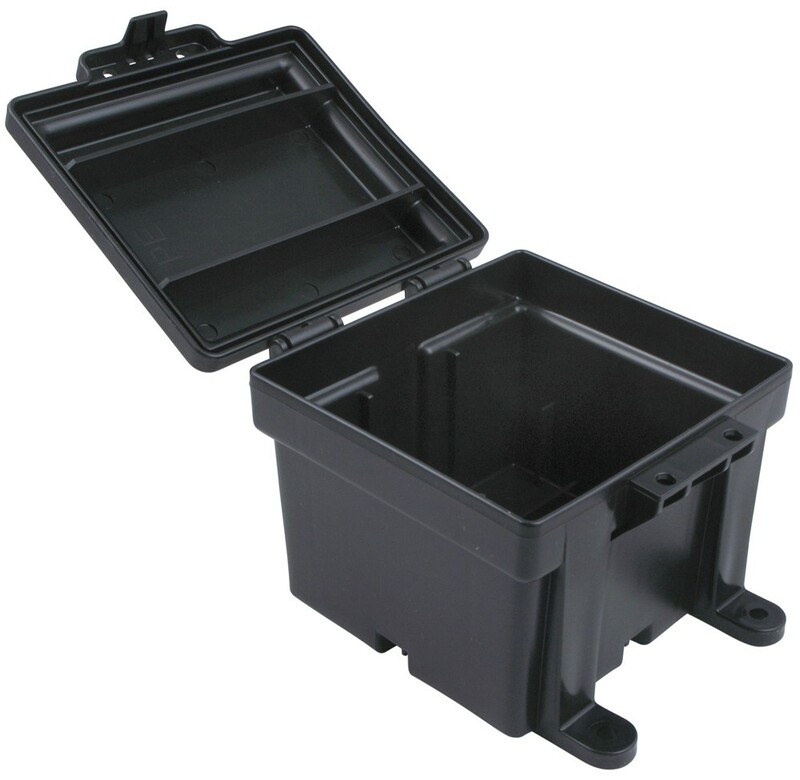 If all you need is a replacement battery box you could get a Replacement Box with Non-LED Lid for Engager Breakaway Kit, part # HM20120. 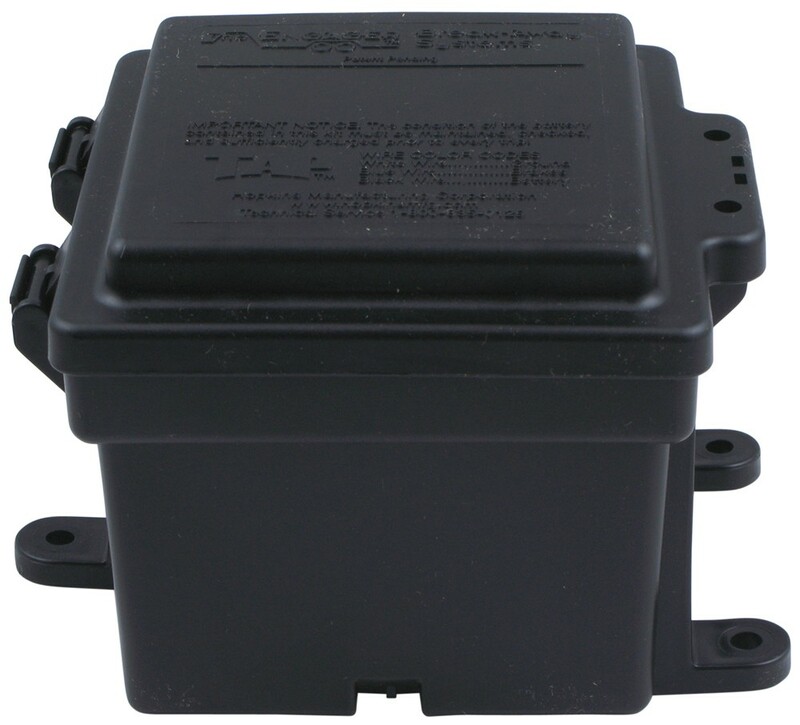 You may also be interested in purchasing a Hopkins Replacement LED Lid for #20099, part # 20106, if you would like an easy way of knowing the condition of the charge on your trailer battery. The dimensions for the Replacement Box with Non-LED Lid for Engager Breakaway Kit, # HM20120, are: Bottom Inside 4-1/4 inches wide x 4 inches front to back x 3-1/4 inches tall Top Inside 4-11/16 inches wide x 4-3/8 inches front to back Outside Overall 5-1/8 inches wide x 6-1/4 inches front to back x 4-1/8 inches tall I have also made a short video showing the dimensions. Yes, I contacted our representative at Hopkins and he informed me that the replacement box that you will need is the Engager Trailer Breakaway Kit part # HM20120. Part # HM20120 also includes a lid, but is interchangeable with the LED lid that you have.